Meet Luke Christie, KA initiate from Furman University and the Youth Chairman for the Muscular Dystrophy Association. Luke is definitely known as “the man” in KA circles around the country. He’s spoken to hundreds of chapter presidents, Convention delegates and many other KAs since his involvement. He is THE driving force in our modern-day national partnership and support of MDA. Luke’s bio information follows below. To learn more about Luke, MDA, and Kappa Alpha Order, watch this video. Luke is the son of Brad and Gloria Christie of Due West, S.C. He has two older brothers, Parker and Spencer, a dog, a cat and goldfish. Luke has spinal muscular atrophy type 2, a progressive neuromuscular dis­ease that causes muscle weakness. He uses a power wheelchair for mobility. Luke, an Eagle Scout, is a sophomore at Furman University in Greenville, S.C., and plans to pursue a career in the communications field. At Furman, Luke participates in the Shucker Leadership Institute, is an admissions ambassador and a member of collegiate DECA and Kappa Alpha Order fraternity. 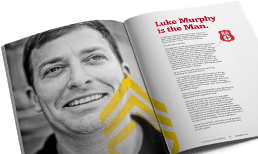 Country music, public speaking, reading, writing, swimming and socializing are just some of Luke’s interests. As MDA National Youth Chairman, Luke spearheads the efforts of thousands of teenagers and young adults who help with the Association’s lifesaving mission. He supports MDA through appearances at sponsor and volunteer events and through media interviews. Luke has served as MDA National Youth Chairman since 2009. He appeared with his family on the nation­al broadcast of the MDA Labor Day Telethon in 2005, 2006 and 2007 to share his story, and again in 2009, 2010 and 2011 as co-host of the youth segments of the show. Luke was the MDA National Goodwill Ambas­sador in 2006 and 2007, and the MDA Harley-Davidson Goodwill Ambassador in 2008.